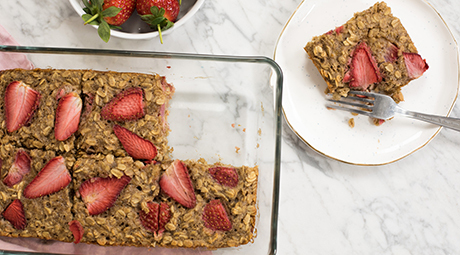 The Healthy Starts for Families program from juice Plus+ aims to inspire healthy living around the world by starting with healthy living in the home. Learn more today! Juice Plus+ clinical research shows those who take Juice Plus+ products can develop healthier immune systems, reduce cardiovascular stress and more. Learn more about Juice Plus+ clinical research. Juice Plus+ starts with farm fresh nutrition. 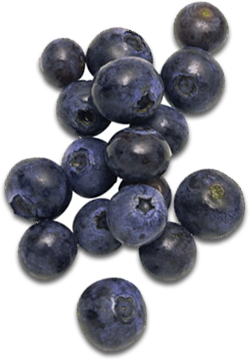 A NSF certified product, each capsule contains family farm grown, organic fruits and vegetables for the best quality nutrition. Busy lifestyles and the abundance of fast food lead many to ask: “How do I get more fruits and vegetables in my diet?” Juice Plus+ adds the nutrition of 25 fruits, vegetables, and grains to your diet. Simple changes today can lead to great health benefits down the road. Jumpstart your journey to better health with One Simple Change. Findings from the Children’s Health Study show fruit and vegetable nutrition helps kids maintain health and wellness. Juice Plus+ Complete helps you achieve a balanced diet and healthy lifestyle, providing whole food nutrition in convenient shakes. 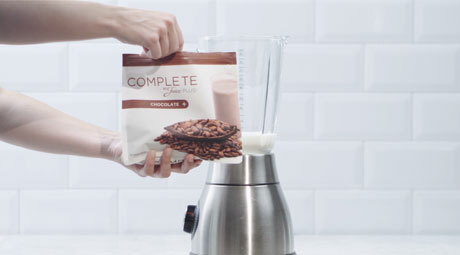 Juice Plus+ Complete is a whole-food-based beverage mix that provides balanced nutrition in every scoop. 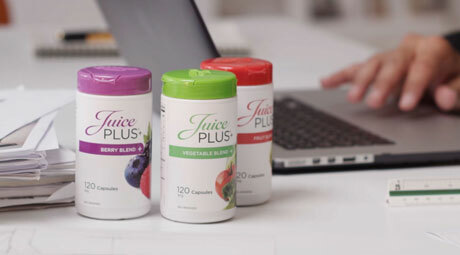 Juice Plus+ Fruit, Vegetable & Berry blends provide added whole food based nutrition from over 25 different fruits, vegetables, grains and berries in convenient capsule form. 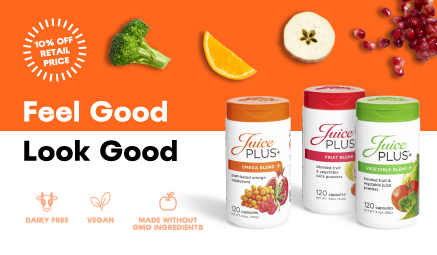 Juice Plus+® Orchard, Garden, and Vineyard Blends provide added whole food based nutrition from 25 different fruits, vegetables, and grains in convenient capsule form. Learn how to bridge the gap between what you do eat and what you should eat with Juice Plus+, the next best thing to fruits and vegetables.